It's May. The grass is springing high and the bracken fronds are still unfurling but despite the early sunshine there's a chill in the air. 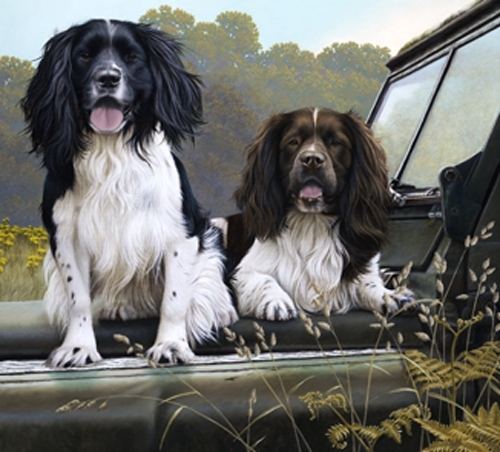 Having been disembarked from the relative comfort of their master's Land Rover, these two wonderful Springers have found a nice warm spot to await the start of their expedition. This is Tom (black and white) and Sam, two very handsome English Springers. I have often been taken to task over my lack of published images depicting black and white Springers. In my defence, I have produced a number but obviously not enough!! I hope this helps to redress the balance. My thanks to Gary, the dogs" owner.